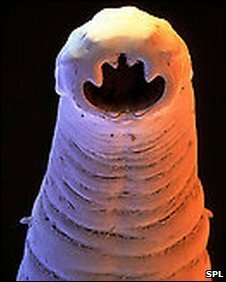 “Parasitic gut worms, such as hookworm, might aid the development of new treatments for asthma and other allergies, a study in Vietnam suggests. Infection with hookworm and other parasitic worms is endemic in Vietnam, but rates of asthma and other allergies are low. British and Vietnamese scientists gave local children treatment to clear their body of worms. “Dr Flohr has examined the links between worms and allergic diseases in Vietnamese children and found that those with the highest level of hookworm infestation were the least likely to have an allergic response to house dust mites. Interesting that the highest level of hookworm infection had the greatest benefit. Clearly, dose matters. I think I need more worms. Yeah, the dust mite isn’t used for helminth therapy. But they’re not the cause of asthma. An inappropriate immune response to a harmless antigen is asthma and other autoimmune diseases. Probably because of a lack of diversity in our microbiome. Don’t blame the innocent dust mite.